If you look closely, you will see a smooshed baby face turned sideways and two little fists below the face….hello baby Luke! Maternity clothes: I found some really long shirts at Kohl’s that I went a size up in that weren’t maternity and love them. I also love yoga pants…a lot. Maxi dresses, maternity jeans, maternity black pants, maxi skirts, long tank tops and shirts, and up-sized workout clothes are the way to go! Stretch marks: No. Still a miracle. Sleep: Seeing that it is two in the morning as I type this, not so good. Tonight the culprit was heartburn. Other nights, it is usually Olivia and worrying about something dumb. 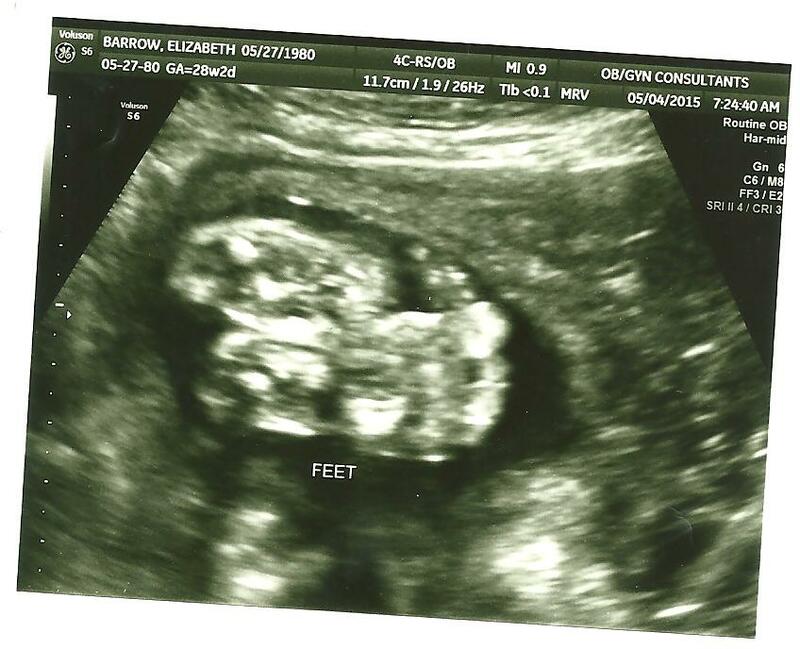 Best moment this week: The ultrasound, of course. 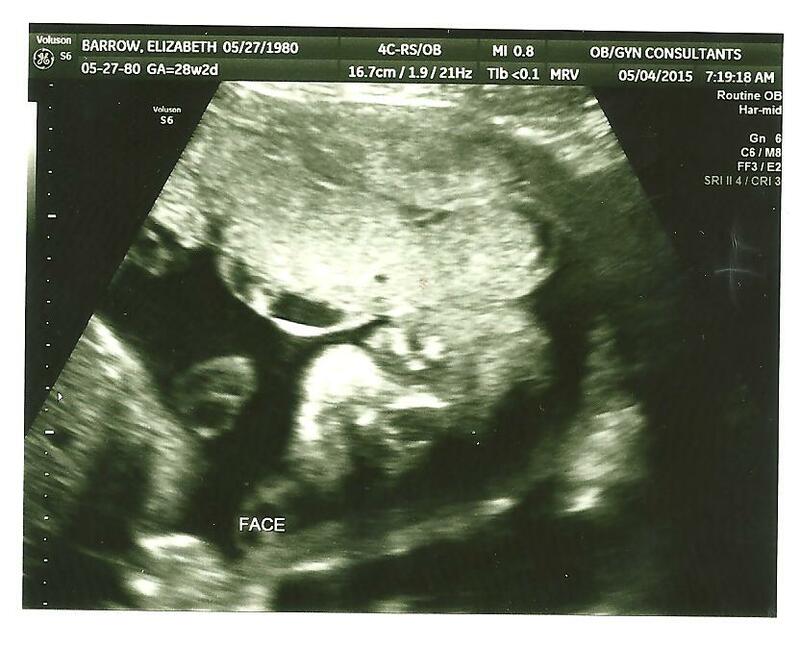 I seriously was stressing about it because we had a red flag on our last ultrasound, but everything was measuring great. He is 2 pounds 11 ounces right now and dead on for all of the other stats! Phew. I thought that the stress of the Chicago trip would have caused something! Miss anything: I have boxes of clothes sitting behind me that cannot be worn. I really missed the bike this week because of the beautiful weather. I keep planning out my future races and workout routines for this fall. It gets me pumped! I think I had such a bad attitude after having Olivia because I kept thinking in the back of my mind that I was just going to gain weight again, when I got pregnant again…not a good attitude by the way! Morning sickness: I’ve been very lucky. The unfortunate side effects for me are heartburn (like three hours later) and extreme hunger. It is ridiculous. I’ll eat a meal and still feel hungry. Movement: I actually can see my stomach move now. He has some big kickers! He loves to kick and move. He switched positions this week from sideways to vertical. It was so weird. Now he is back to his feet on my left side and his head on my right. He is sitting really low! Food cravings: I was not this ravenous with Olivia. Anything making you queasy or sick: Not anymore. Once the second trimester hit, I was okay. Have you started to show yet: Of course. People think I’m going to pop any second. Sleeping is super uncomfortable. They didn’t measure my stomach, but I feel like I am measuring bigger. I blame it on the fact that I had no core at the beginning of this pregnancy so all my belly fat is laying on top of him. Gender prediction: Boy. 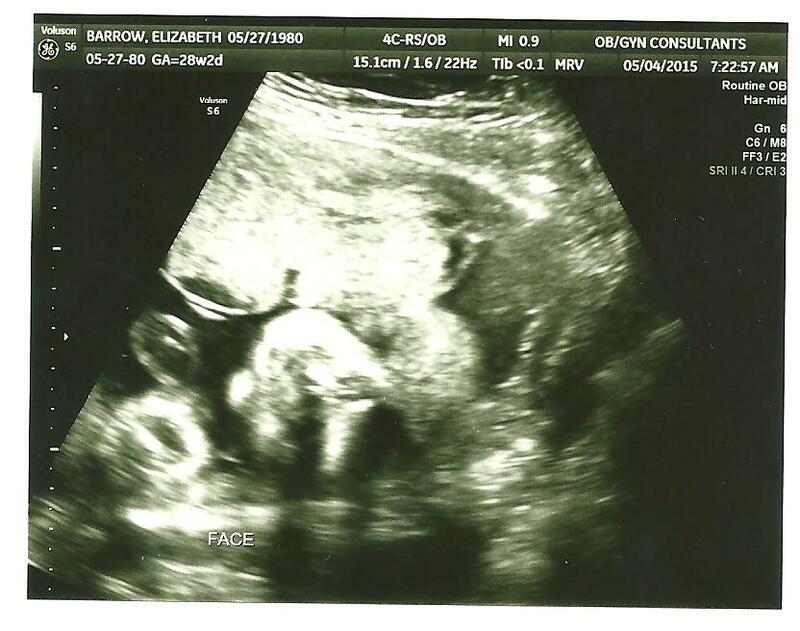 Mike was able to see the parts again during the ultrasound and congratulated him for staying a boy. Labor signs: No. I was told that I will be having the baby a week earlier than expected. I will find out a few weeks from now what my exact schedule will look like this last trimester. So crazy that I am in the final stretch. We are not in as much of a hurry this time. Hmm…I wonder why. Belly button in or out: Flat and weird, as usual. Happy or Moody most of the time: Let’s just say that I don’t hold back when it comes to what I think, when I am pregnant. Little things bother me more than when I am normal, so I am quick to let people know what is on my mind. Not sure that is a good thing. I’ve been a lot happier the last few weeks because my mom has been here to cut me some breaks with Olivia when she is driving me bananas…and she is driving me bananas with her two year old ways! Looking forward to: Taking in as much time as possible with one child before the craziness of two kids enters my life!